I can still remember reading Presumed Innocent, almost like it was just last week. I remember being enthralled. I remember -- even more vividly -- being breathless when Rusty Sabich, the book’s protagonist, revealed that the bloody whatchamacallit had been used to kill Carolyn Polhemus. At that moment, I suddenly thought, horrified, has Turow duped me? Did Rusty do it, after all? It was a major moment, and it’s never left me. Now, 25 years later, Turow has delivered the sequel to Presumed Innocent, titled simply Innocent (Grand Central). Both titles, in addition to being classic courtroom dramas and absolutely unforgettable reads, are shrewed commentaries on the legal system and our own personal system of meting out justice. Rusty was never much presumed innocent, and he’s far from innocent now. 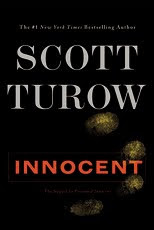 Reading Innocent, I kept harkening back to Presumed Innocent, losing myself, as before, in Turow’s brilliant, provocative sentences and tightly knotted plot. The new book finds many of the characters from the first one: Rusty, the onetime lawyer who’s now a judge in Kindle County; his wife Barbara, whose death opens the book; their son Nat, now all grown up; and Tommy Molto, Rusty’s nemesis from all those years ago (and they’re still going at it). The new players include Tommy’s right hand, Brand, who’s out to get Rusty even more than Molto is, and Anna, Rusty’s assistant and, before the book’s over, his son’s girlfriend. Of course, none of this is really as simple as it seems. Though I feel compelled to say more, Innocent is so good, so well written and so fun to read, that I fear spoiling even one page would do you a terrible injustice. Like it’s older sibling, this new novel is filled with political intrigue and the highly detailed machinations of a stay-up-all-night-reading courtroom trial. Once again, Rusty is in the defendant’s chair, once again represented by Sandy Stern, diseased but no less diminished in his power. Rusty himself, though certainly the book’s hero, is also its most flawed character. He was plenty soiled in the earlier book, too, and while he’s apparently tried to remain on the straight and narrow since then, life has offered some distractions that felt just too tasty to pass up. Turow goes to great lengths to explain Rusty, though doesn’t for a moment ask us to like the guy. In a way, I think, Turow knows Rusty’s faults make him more human -- and thus, more like us. Despite what you feel for him as a person and as a man, you root for him as a character. It’s a fascinating spot to put readers in. Thanks, Mr. Turow. But Rusty isn’t the only indelible character between these covers. The author composes all his characters with unnerving expertise. Turns of phrase, telling details, surprising sympathies, and newly revealed relationships -- not to mention a riveting plot -- each new page brings more reasons to love this novel. The most impressive thing Turow does is not to spoil the first book. He doesn’t say who killed Carolyn Polhemus -- just in case someone might read Innocent first. Whether or not you’ve read Presumed Innocent, you will find an amazing novel here. But if you have, you’ll find that Scott Turow has built in extra layers of fun for you; yes, knowing certain things brings more meaning to everything that happens here -- but not knowing them diminishes absolutely nothing. That’s the mark of a masterwork.